Extra heavy-duty, folding 6" truss frames and legs accommodate virtually any size. Welded 1" aluminum tubing forms a sturdy yet lightweight 6" x 1" truss member for frame and legs. Frames bolt together with "speedy cranks" to allow easy "set up" and "tear down" without tools. All components fit into durable carrying cases for convenient transport and storage. 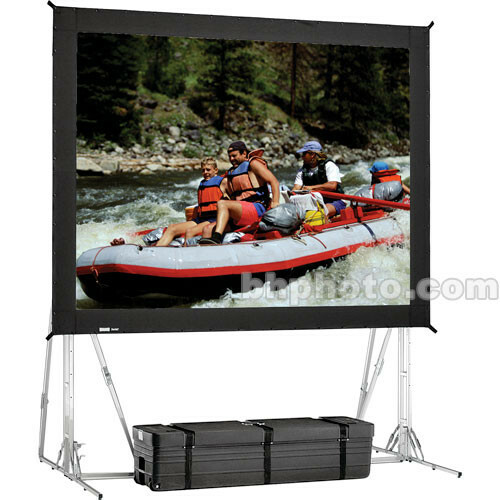 Front and rear projection screen surfaces can be interchanged at any time. Screen can be adjusted up or down in 6" increments. All surfaces up to and including 12' high will be seamless. Optional Drapery Presentation Kit gives professional stage front appearance. Box Dimensions (LxWxH) 66.0 x 18.0 x 12.0"